The Canon 5DS R is a variation of the 5DS boasting a 50.6-megapixel CMOS sensor with a low-pass cancellation filter which is said to optimise sharpness even further and delivery extraordinary clarity. The 5DS R is aimed at the most demanding professionals looking for the maximum level of detail possible in both stills and movies. The camera's dual DIGIC 6 processors and 61-point AF system with iTR AF ensure quick and accurate focusing even when tracking moving subjects. 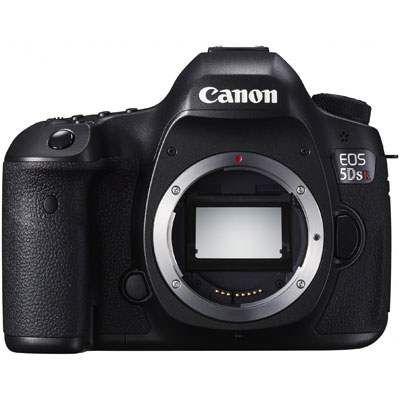 As with the 5D MK III which it sits above in the range, the 5DS R adopts a fully weather-sealed, magnesium-alloy construction, dual card slots (CF and SD), an optical viewfinder with 100% coverage and a large 3.2" LCD screen, in addition to Full HD video recording, 5 fps shooting, USB 3.0 connectivity, an ISO range of 100-6400 (exp. 50-12800) and an array of ergonomic controls which can be customised to suit your style of work. For photographers wanting the ultimate in high resolution capture, the EOS 5DS R camera has a low-pass filter* (LPF) effect cancellation. While a low-pass filter is useful to reduce color artifacts and moiré typical with digital capture, it also reduces detail at the pixel level. With the LPF disabled, the EOS 5DS R takes full advantage of the original resolving power of the camera's 50.6 Megapixel sensor. More detail is captured and retained in the original image, perfect for landscape and commercial applications where pixel-level detail is scrutinized and when the sharpest possible image is needed. * The possibility of moiré and color artifacts is greater due to the LPF cancellation function. The EOS 5DS R camera features Canon's newest full-frame CMOS sensor. At 50.6 Megapixels, it's the highest resolution sensor in the history of EOS. It captures 8712 x 5813 effective pixels, delivering images with an unprecedented level of realism perfect for large-scale commercial printing, fine art, significant crops and any number of other high-end applications. Thanks to this amazing sensor, engineered to work in concert with dual DIGIC 6 Image Processors, the EOS 5DS R is a remarkable, high-resolution camera with impressive performance. The EOS 5DS R camera has an amazing iSA Intelligent Scene Analysis system that employs an independent RGB+IR light sensor with approximately 150,000-pixel resolution. This sensor enables Canon's Intelligent Tracking and Recognition system (iTR AF) that detects and tracks subjects, automatically switching the AF point to optimize tracking. With new tracking algorithms tailored to recognize faces and colors, this system serves as a brilliant foundation to the EOS 5DS R's AF system. For fast, precise AF with sophisticated tracking performance, the EOS 5DS R camera has an advanced, 61-point High Density Reticular AF system with up to 41 cross-type AF points. The EOS 5DS R's AF system is incredibly sensitive to changes in composition, making adjustments quickly to help ensure consistent, sharp AF. A new RGB+IR AF (with approximately 150,000 pixels) sensor monitors subject motion, and Canon's iTR Intelligent Tracking and Recognition system synchronizes the active AF point with the subject's motion, helping to ensure that AF precision is maintained. With focus modes dedicated to the particulars of the shooting environment, the EOS 5DS R realizes a level of focus accuracy befitting its 50.6 Megapixel sensor. The camera shake that occurs from the impact of an SLR's mirror can leave blurred details in the recorded image. This effect is magnified when working with a super high-resolution sensor like the one found in the EOS 5DS R camera. To counter the effects of conventional, spring-driven SLR mirrors, the EOS 5DS R features a newly developed Mirror Vibration Control system. The camera's mirror is not controlled by springs but instead is driven by a small motor and cams. This system suppresses the impact typical of the camera's mirror, significantly reducing impact and its effects on the image. A new Time Release Lag setting, easily accessed on the EOS 5DS R's menu system, offers added protection against camera shake by setting the shutter release time intentionally longer so the camera does not begin the exposure until after the impact of the camera's mirror has diffused. With Canon's Anti-flicker function, the EOS 5DS R camera is able to deliver accurate results under cycling lighting situations. Under flickering light, such as fluorescent lighting, a fast shutter speed may result in an irregular exposure. The EOS 5DS R's Anti-flicker function detects the frequency and phase of the flicker and captures images near the point of peak brightness when the subject is most likely well illuminated. The EOS 5DS R camera offers time-lapse fixed-point shooting and long exposures without the need for a remote control. The EOS 5DS R's interval timer takes from 1 to 99 shots at preselected intervals (from 1 second to 99 hours 59 minutes 59 seconds, or unlimited), ideal for shooting flowers as they bloom or clouds drifting through the sky. Captured exposures can even be collected and saved as an HD movie. Its built-in bulb timer keeps the shutter open for a designated amount of time, perfect for night photography, to capture the flow of traffic on a street corner, or any other situation where long exposure photography is warranted. For still photography, the EOS 5DS R camera features the flexibility of a cropping feature that extends the shooting effect 1.3x and 1.6x. With 50.6 Megapixel capture, cropped shots are possible with plenty of resolution to spare. Images recorded at 1.3x (APS-H) are approximately 30.5 Megapixels (6768 x 4512) Large/Fine JPEG, while images recorded at 1.6x (APS-C) are approximately 19.6 Megapixels (5424 x 3616) Large/Fine JPEG. Particularly useful in extending the range of telephoto lenses, the crop function also improves the EOS 5DS R's subject tracking capability with almost the entire frame covered with AF points. Image cropping can be displayed in the viewfinder either masked or overlaid with an outline showing the cropped area, and in Live View shooting the image is cropped by the effect chosen. Aspect ratios can also be defined, with the EOS 5DS R shooting in 1:1, 4:3, and 16:9 ratios, in addition to the default 3:2. The EOS 5DS R camera's Intelligent Viewfinder II makes it easy to both shoot, change and confirm camera settings and shooting modes all without looking away from the viewfinder. Displaying approximately 100% of the composition, the viewfinder can show settings like shooting mode, exposure level, white balance, drive mode, AF operation, metering mode, recording format, an electronic level and more. All of this information can be displayed by or superimposed easily over the image for review while shooting, and multiple views are customizable through the EOS 5DS R's simple user interface. The EOS 5DS R camera is a sophisticated movie-making machine, capturing Full HD movies with numerous manual controls at multiple frame rates and compressions. Featuring movie capture and manual controls, the EOS 5DS R's shutter button can be programmed to capture still images when pressed during movie shooting. An EOS first, the EOS 5DS R camera even has a time-lapse movie feature that takes still photos at set intervals and joins them to create a silent movie. Perfect for showing the moving clouds across the sky, growth of a plant, changes in scenery, the flow of people walking and more, the EOS 5DS R's Time Lapse Movie function creates professional-quality movies, in camera, without the need for a computer, saving precious time when out in the field. The EOS 5DS R camera can continuously shoot up to 5.0 frames per second. Thanks to its speedy dual DIGIC 6 Image Processors plus its enhanced shutter mechanism and mirror drive, the EOS 5DS R is capable of capturing full 50.6 Megapixel images at high speed with superb quality. This sophisticated balance between high pixel count and shooting speed ensures the EOS 5DS R is always ready for the next shot. The 3.2-inch ClearView II LCD monitor has 1,040,000 dots, anti-reflective construction and features Canon's ClearView technology for a bright, sharp display in any number of shooting situations. It's ideal for reviewing settings and images, as well as for shooting in Live View mode. In Live View, grid lines can be displayed in 9 sections, 24 sections, or 9 sections with diagonals, as can the electronic level, which helps ensure accurate level by displaying roll. For image review, the EOS 5DS R camera has a dedicated Magnify/Reduce button for zooming in or out (up to 16x) simply by pressing the button and turning the Main Dial. Images can be protected or erased quickly, individually or in batches, and slideshows can be created with some or all images and can be sequenced by date, folders, movies, stills or rating. A clear and simple feature guide found in the camera's menu provides detailed reference information whenever needed. In addition to a conventional Quick Control screen, the EOS 5DS R camera features a Quick Control button that enables the photographer to quickly and easily access the settings critical for the task at hand. The user can specify features to display, as well as their location and size on the screen. With the level of customization the Custom Quick Control screen offers, the EOS 5DS R can work perfectly with the style of any photographer. The EOS 5DS R camera features a USB 3.0 digital terminal for fast transfer to PCs and printers, plus offers connectivity to Canon's WFT-E7 (Version 2) for wireless transfer and Wi-Fi compatibility. NOTE: For connecting an interface cable to the USB 3.0 terminal, a cable protector is included with the EOS 5DS R, and must be used at all times to protect the camera's circuit board.